The medical marijuana green rush is officially on in La Mesa. And just like California’s historical Gold Rush, prospectors — or in this case prospective marijuana dispensary businesses — are fighting to stake their claims. The stakes are high. Winners that are given a coveted CUP (conditional use permit) from the city will be able to open a dispensary business and be a part of the multi-billion-dollar cannabis industry. Losers who are edged out of their claim by strict separation rules can end up spending tens of thousands of dollars or more on startup costs, only to have their dreams dashed by votes by the Planning Commission and City Council. 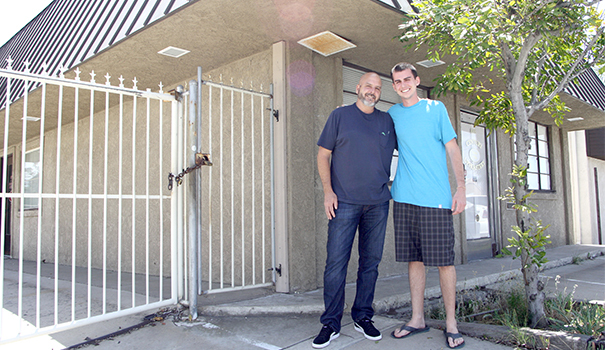 On March 27, father-son business partners Sean and Corey McDermott became the first green rush prospectors to be granted a marijuana-related business CUP by the city for their future dispensary named The Grove, located at 8155 Center St. in La Mesa’s industrial zone. The CUP was granted after the City Council voted unanimously to reject an appeal by a rival dispensary that will now be unable to open because of a rule prohibiting two dispensaries from operating within 1,000 feet of each other. The McDermott’s dispensary being first is fitting. When the city announced the date it would be taking proposals from prospective marijuana businesses after Measure U passed, Corey McDermott was first to line up at City Hall — several days before the city would actually take the proposal. “I knew there was going to be a line based off what I had seen happening in other cities and we wanted to be first in line because we knew we’d be competing with at least one other person,” Corey McDermott said. The line for turning in applications has been an issue for both the city and the applicants from the very beginning. The day that Corey got himself first in line at 9 a.m. was the same day and time the city held a meeting about the application process for prospective businesses — a meeting Sean McDermott was at. “[A city representative] told me at that meeting, ‘There isn’t going to be a line.’ I said, ‘I’m sure there is because there are people in line right now.’ And literally 10 people jumped up and left the meeting right then and raced over and got in line,” Sean McDermott said. That line eventually grew to be several dozen people who were prepared to sleep in front of City Hall in order to not lose their place in it, and their chance to be one of the first applicants. So, to avoid the mess of applicants camping on the City Hall walkway and Allison Avenue sidewalk, the city issued numbers based on an applicant’s place in line and applications were received by the city planning department in that order. Despite the complaints of applicants who ended up being late to the line, and therefore upset about the order their proposal would be received, finding a better system to organize applications has been elusive for most cities. Although the line system solved the issue of keeping applicants from camping out on the street, it was not used to determine which projects would first go to the Planning Commission for a vote. Applications from the line order were only used for “initial consideration for processing orders,” said La Mesa Director of Community Development Kerry Kusiak. So, despite being first in line to hand in an application, the McDermotts found themselves in a race with eighth-in-line applicants Tom and Anganette Perkins to be first to hand in a completed proposal that met city standards and the conditions of Measure U. The Perkins CUP application was for a dispensary within 1,000 feet of The Grove. According to the city planning department, the McDermotts submitted their final proposal on Oct. 25 and the Perkins submitted theirs on Oct. 26 — a single day difference. At the appeal hearing on March 27, Tom Hurner, an investor in the Perkins’ dispensary, said he was told by the city that the line order would not be the governing factor in determining which projects would be heard, but was unconvinced that the line order did not play a part in how the city treated the proposals. He also complained of “city-generated delays” that made the application more expensive. “The result of this horse race process was that each time the city would make a request, we would have to expedite a response,” he said. “The city would even state the date it would need to be returned. This led to significant additional costs. The costs the Perkins’ incurred in just going through the application process is what makes the stakes in the green rush so high. For the McDermotts the gamble paid off. But if they had a slip up and didn’t get something done and were then denied the CUP, how much had they already spent on preparing the application? Some of those other costs that dispensaries accumulate during the application process include paying for an architect to draw plans for the dispensary site that include state and local requirements for safety and security, as well as legal costs of hiring a land use attorney to help navigate the complex laws governing medical marijuana. “I understand that there needs to be scrutiny, but [the process] seems a little excessive,” Sean said. Despite the excessive scrutiny involved with opening a marijuana-related business, the McDermotts said they were impressed with La Mesa’s planning department during the application process. “I think the city of La Mesa’s endeavor is real. I believe that they truly want to get everybody licensed,” Sean said, adding that he attributes the city’s efficiency to a well-funded, well-staffed planning department and a well-written city charter. Corey McDermott was surprised by the professionalism the city had in treating him and his father as they applied for a business that some still view very negatively. “I would say we were treated like any other business applying for a CUP,” he said. Now that the Planning Commission has granted The Grove its CUP and the City Council rejected the Perkins’ appeal, there is only one more piece of red tape before construction can begin — a review by the building department, which the McDermotts hope to have completed by the end of April. Once they receive they green light from the building department, they expect construction will take around two months and are aiming for a July 1 opening. “We’re going to be the [dispensary] for the more discriminating patient that wants that extra level of customer care, that wants to feel secure,” he continued. Although interior construction to create the clean look the McDermotts want for The Grove includes moving a bathroom, building security walls, installing security glass, and cosmetic work, most of the building improvements will be on the exterior — rebuilding and landscaping the sidewalks and parking lot. Improving the exteriors of the buildings and sidewalks along Center and Commercial streets is one of the city’s goals to improve the aging industrial area. “They came out with a really great, although expensive, plan to change the reveal of Center Street on the back of the marijuana industry,” Sean said. In addition to The Grove dispensary, the surrounding area will soon house a multitude of other kinds of marijuana businesses. Sean said he already knows of around 10 nearby buildings that will be converted to production facilities — either grow operations or manufacturing products like edibles, lotions, tinctures, pills and more. One of those buildings belongs to Tom Perkins. When The Grove opens, it will employ around 20 people and carry every type of THC and CBD product available, although it will not carry paraphernalia items such as bongs and pipes. Sean McDermott said that he wants La Mesans to just come in and visit the dispensary when it opens to see the shop and learn about medicinal marijuana.